When you come to Indonesia you shouldn’t miss visiting the largest Buddhist temple in the world, located in Central Java: Borobudur. It is impressive! It is actually the number one sightseeing site on the list of every tourist coming to the Java island. When you visit the temple you are recommended to follow these directions for going around it: you start from the east side and you go clockwise around the paths and up the top. You can get down only from the south, east or west part and eventually exit the complex only in the north. 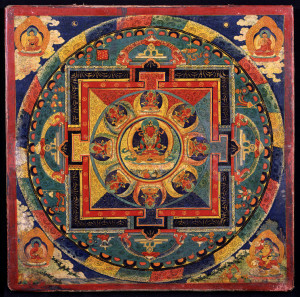 It is in this way there is formed a pilgrimage path that leads you through the three symbolic levels of Buddhist cosmology, decorated with extensive narrative relief panels: Kamadhatu (the world of desire), Rupadhatu (the world of forms) and Arupadhatu (the world of formlessness). 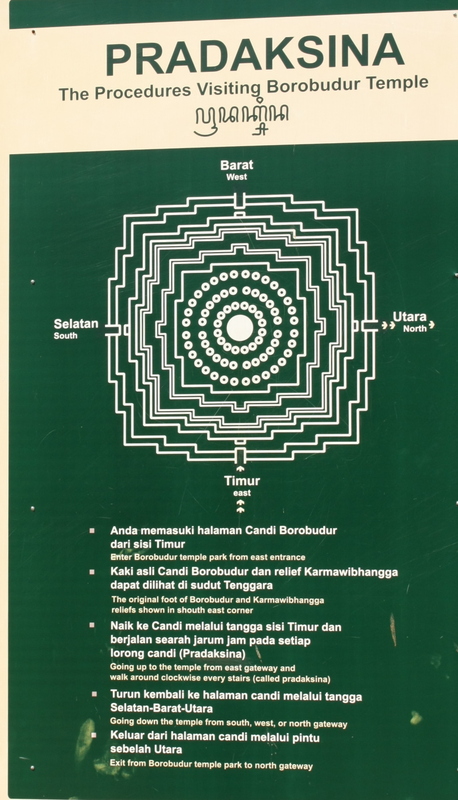 Most probably it was approximated that Borobudur was built in the 9th century when the Sailendra Dynasty – which was actively promoting Mahayana Buddhism – was ruling Java, the temple being designed in Javanese-Buddhist architecture style with Indian (Gupta) influences. 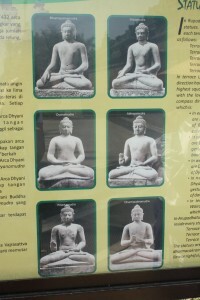 Evidence suggests that Borobudur was abandoned around the 14th-century because of the decline of the Hindu-Buddhist dynasties in Java and the conversion to Islam. After its abandonment the temple was covered in volcanic ash and in jungle vegetation and it was mentioned only in folk stories. These stories caught the attention of Sir Thomas Stamford Raffles, the British ruler of Java in 1814, who started the process of finding and recovering the monument. It took a long time, until 1835 to clear the entire area of the temple. Still, the temple was no so well preserved and under the Dutch colonial occupation, eight containers full of Borobudur statues were given as presents for the King Chulalongkorn of Siam during his visit to Indonesia in 1896. The relics are still on display in the National Museum of Bangkok. The largest restoration project was unfolded between 1975 and 1982 by the Indonesian government and UNESCO, collaboration which marked the enlisting of the monument as a UNESCO World Heritage Site. About 40 km North West from Yogyakarta, Borobudur is located in an elevated area between two twin volcanoes, Sundoro-Sumbing and Merbabu-Merapi, and two rivers: the Progo and the Elo. 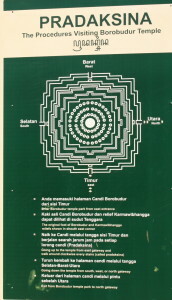 The area was known as the mythological Kedu Plain, a Javanese sacred place or the garden of Java because of its high agricultural fertility. What’s even more interesting is that during the restoration in the 20th century it was discovered that the other two Buddhist temples in the area, Pawon and Mendut are positioned along a straight line with Borobudur. 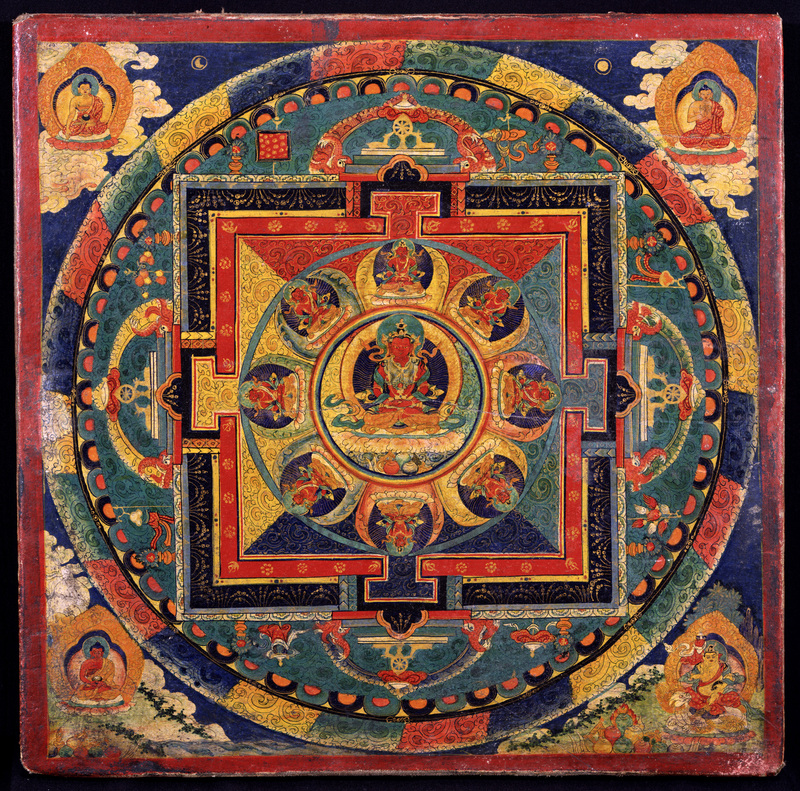 Therefore hypotheses about a relationship between the three temples arose. 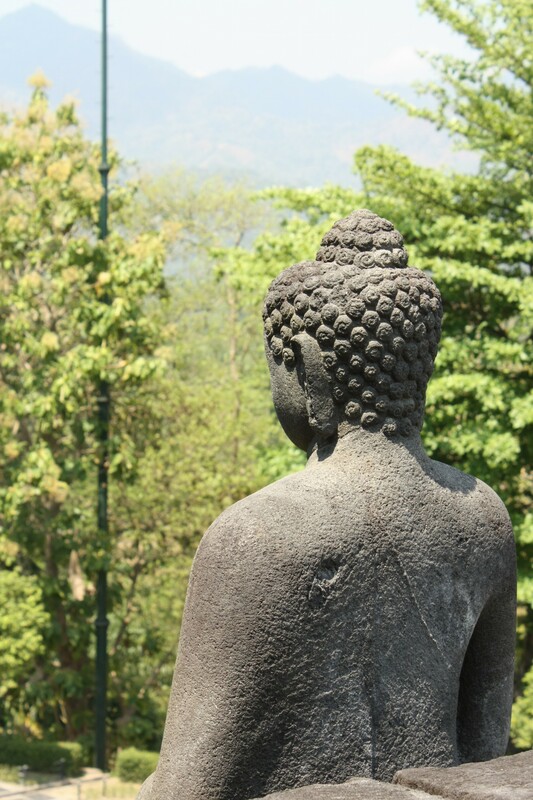 One folk myth talks of a paved road with brick walls that went along from the first two temples to Borobudur. No evidence to support this idea was found though. 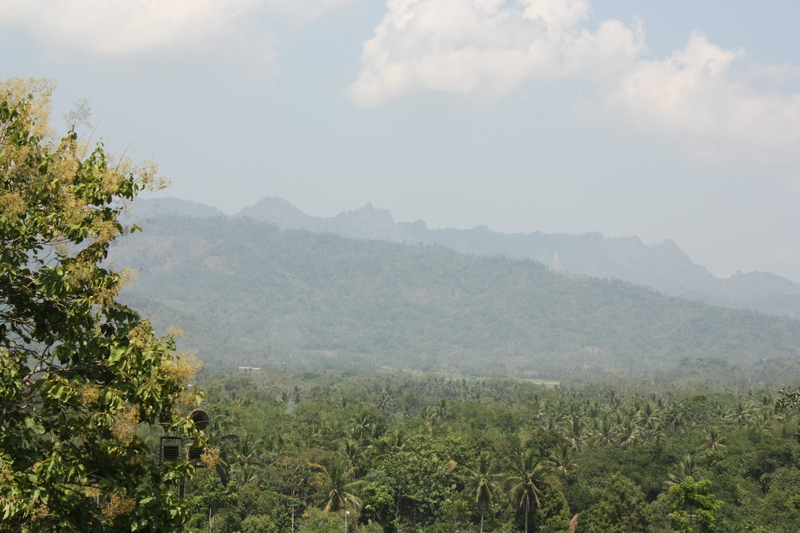 folk story: can you spot in the distance the profile of the giant who is lying down, taking a rest after finishing building the Borobudur? So, there is no reason to argue, the Borobudur temple is an architectural jewel that was very well preserved under volcanic ash during its time of, not certain why, neglect. During my visit there I could not stop myself to wonder about two things: how was this amazing temple built?? 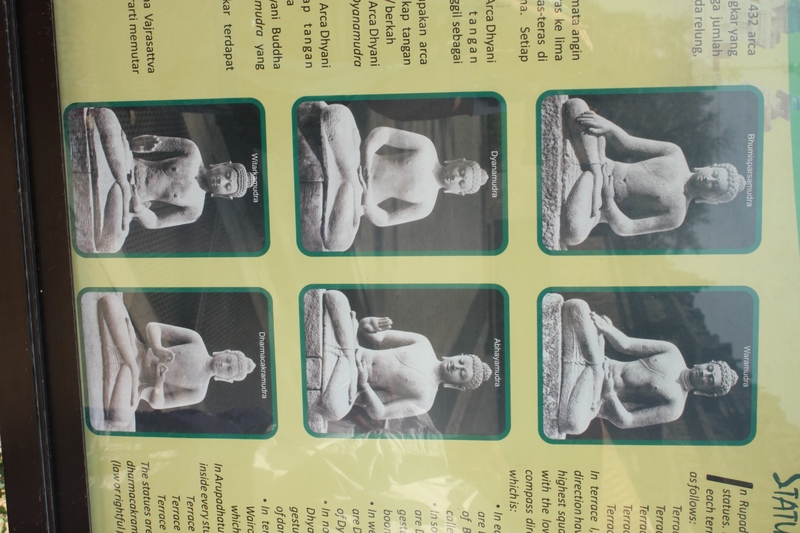 and would any Buddha really want this kind of a devotion monument? The exquisitely carved panels placed along the monument depict a sophisticated society, representing a pictorial history of the architecture, means of transport, clothing and customs of the people who have most probably left behind this astounding temple. Nevertheless, their culture and advanced technology rose and fell more than a thousand years ago for reasons unknown, leaving space for a lot of speculation. One theory goes so far as stating that the culture who built Borobudur had the knowledge to stop gravity and use it in its advantage for building. As for the second question, I give myself an answer: no, I don’t think any Buddha would want a monument like this, but for sure, the people who are devoted to the Buddhist life philosophy want to express their love, commitment and gratitude for their chosen life view. Also, when designing and building a monument of this magnitude, I think it is a way you want to preserve and show to your followers the truths you discovered and the life philosophy that you believe is best to be undertaken. And when it comes to the rise and fall of the Borobudur and the dynasty that built it, I believe one evidence is sure: nothing is permanent, not even the most sophisticated cultures and their developed technologies. Everything works in cycles: it emerges, it grows, it reaches a peak and then it declines. For this, there is no reason for any of us to be attached of anything, because nothing stays forever.